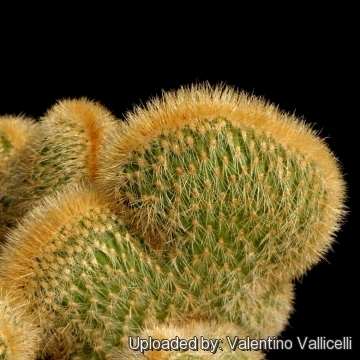 See all synonyms of Cleistocactus sp. 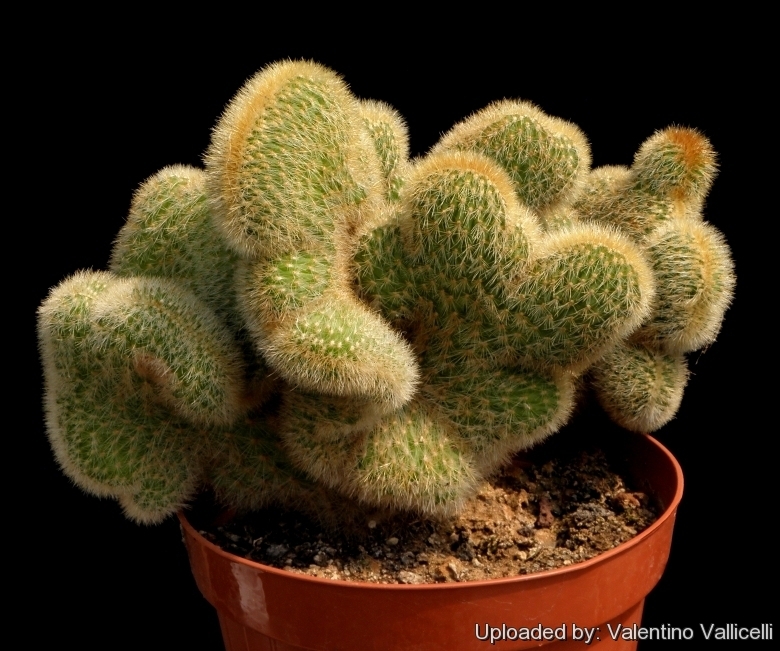 Description: This is one of the innumerable crested clone of Cleistocactus found in cultivation, most of this cristates are hybrid and have not received any formal name. Stem: The beautiful crested form, here described, (Clone C) has medium sized fan-like stems and creamy yellow bristly spines, it can form in age a large convoluted mound and can reach a considerable size (up to 40 cm in diameter, or more). Areoles: Small roundish, greyish-white felted. Spines: It has many short bristly creamy-yellow coloured spines all quite similar in shape, that literally cover the surface of the stems. Cleistocactus sp. 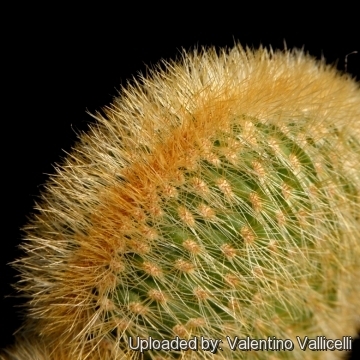 f. cristata clone A: (Borzicactus sp. “f.ma cristata”)”) has large growing green fan-like stems with short bristly but firm pale-creamy spines all quite similar in shape. Cleistocactus sp. f. cristata clone B: has medium sized stems densely covered by ginger coloured soft spines..
Cleistocactus sp. f. cristata clone C: has medium sized fan-like stems and creamy yellow bristly spines all quite similar in shape, that literally cover the surface of the stems. Cultivation and Propagation: It is not too difficult in a greenhouse, although grows quite slowly. It is usually seen as a grafted plant but can grow on its own roots too.